WTM London 2017, the leading global event for the travel industry, will once again host the Wellness Symposium organised by Global Wellness Institute. The symposium, held over two days (November 6 and 7) will include two dedicated sessions which will feature a number of topics and industry leading speakers. This symposium will kick off on November 6 at 10:30 in the WTM Inspire Theatre with The Future of Wellness Travel covering a range of topics including The Essence of Wellness Tourism and Wellness Trends 2030. Wellness icon Susan Harmsworth, founder and chairman of ESPA International, a market leading company which offers a range of luxury spas and treatments, will cover Luxury: Past, Present, Future during the morning symposium while the well-known white island of Ibiza will be used as a case study to discuss wellness marketing and PR, and will be presented by Vicente Torres, Insular director in Tourism for Ibiza and Delia de Miguel, coordinator for Ibiza is wellness. On November 7 at 13.00 in the WTM Inspire Theatre, 'Differentiation in Wellness Travel is a Competitive Advantage' will be covered. Topics such as the 'Latest Facts and Figures in Wellness Tourism' and 'The Newest, Most Exciting and Unusual Healing Offerings in The World' and 'Wellness Travel is Differentiating: Medical vs Wellness', 'Boomers vs. Millennials', 'Technology vs Back to Nature' will all be looked at and discussed by leading speakers. Tourism stalwart Jean Claude Baumgarten, former president and CEO, World Travel & Tourism Council will take to the stage to shed light on Tourism & Wellness: Endless Discovery. Plus, Italy will be highlighted as case study during the session Wellness Assets Rooted in History: Thermal Springs, Spas, Wellness, Naturally Healthy Gastronomy, Culture. Along with these two insightful encompassing sessions organised by the Global Wellness Institute, WTM London will host a dedicated lounge on the exhibition floor for wellness and spa where travel buyers and suppliers can meet and conduct business. Up to 30 meetings will be held over the first two days of WTM London between wellness suppliers and buyers conducting new business and brokering new relationships. 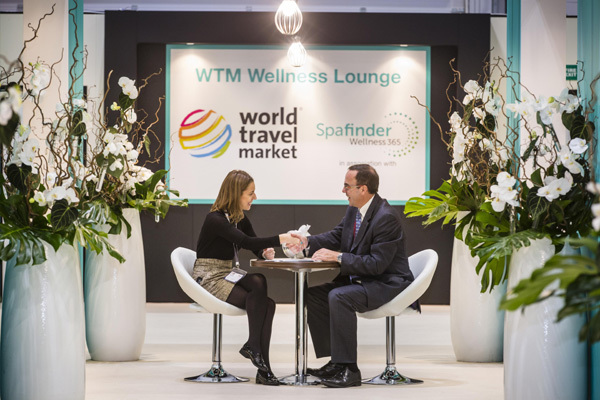 WTM Portfolio conference and seminar manager, Charlotte Alderslade said: “Our strong partnership with Global Wellness Institute, along with the popularity of the dedicated lounge on the exhibition floor really highlights the growing representation of the wellness tourism sector at WTM London. “Although once a niche market, spas and well-being centres are becoming central to mainstream travel products."